(RDBS). 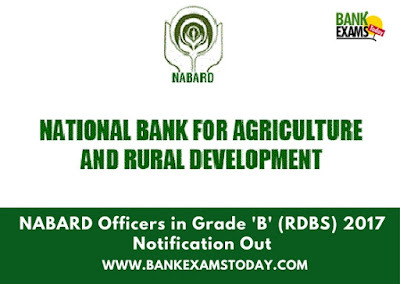 Applications are invited from Indian citizens for the post of Manager in Grade ‘B’ in the Rural Development Banking Service (RDBS) in National Bank for Agriculture and Rural Development (NABARD). Candidates can apply only ON-LINE on NABARD website www.nabard.org between 16 June 2017 to 07 July 2017. A candidate can apply for Manager (RDBS) under only one option from among the options given at Table-I (a) & (b). It is clarified that candidate applying for Manager (RDBS)- General cannot apply for Manager (RDBS)-Agriculture and vice a versa. In case of applications for both the posts, the last application submitted will be considered valid and fee against the other application will be forfeited. PWD candidates applying against Unreserved posts will not be eligible for relaxation in percentage in Educational Qualification. They may, however, be eligible for relaxation in Age and Fee. Bachelor’s Degree in any subject from any recognized University with a minimum of 60% marks (SC/ST/PWD applicants 55%) in aggregate or Post Graduate degree with a minimum of 55% marks (SC/ST/PWD applicants 50%) in aggregate from a recognized university. Bachelor’s Degree in Agriculture with 60% marks (SC/ST applicants 55%) in aggregate or Post Graduate degree in Agriculture with a minimum of 55% marks (SC/ST applicants 50%) in aggregate or its equivalent grade from a recognized university.